The house is set over two floors and is connected to both mains electricity and water. There is a typical “calçada” (Portuguese cobblestone from granite blocks) driveway coming up from the street. The neighboring house is set back a bit, so does not impede with one´s privacy. Upon entering the patio, we have access to an open garage on the ground floor of the house. From here, we have the main entrance door, leading into a good sized den. From the den, in direction of the front of the house, we have a smaller den which leads to two good sized bedrooms, each with a three-door built-in wardrobe. The bedrooms each have a balcony to the front of the house. From here you have good views into the tranquil surroundings. We have a fully tiled family bathroom with bathtub, toilet, bidet and wash basin in polished sand stone surrounds with storage space beneath. In the other direction, the den leads to the master bedroom with door to the open patio. There´s a little hallway with a three-door built-in wardrobe leading to the private bathroom. The bathroom is fully tiled, has a bathtub, toilet, bidet and wash basin in polished sand stone surrounds with storage space beneath. The floors of the bedrooms are wooden laminate. There are air-con units in all bedrooms. From the entrance den we have marble stairs with wooden banister going up to the first floor. From the landing, we have two doors to enter a large dining / living room with large glass sliding doors leading unto a very spacious veranda. There is an open fireplace in the living room, currently blocked, with a log burner in situ for the cooler winter evenings. There is also an air-con unit. To both front sides of this large room there is a sliding door to a smaller terrace each. The one to the right leads into a room with sloped ceiling which is currently used for storage. At the end of the landing, there is a bathroom with toilet, bidet and wash basin with polished sand stone surround with storage space underneath. Opposite the living room we enter the fully tiled and totally equipped kitchen. The kitchen has a door to the rear of the house, where we have a large terrace for outdoor dining. The open space surrounding the house is completely laid in “calçada”. There is also a wooden annex, now used to store the garden furniture, on this large terrace. The plot of this property is on a slope and is configured into four levels. The first level currently has a good number of citrus trees planted, with calçada around them, but would suit itself as the space to install a pool if so desired. The remaining levels of the plot have a large variety of different fruit trees and decorative plants. On the uppermost level of the plot we have a parking lot for three to four cars, also laid in calçada and a metal gate with vehicle entrance. The access to this upper part of the property is on a tarmacked lane ending in a cul-de-sac just a few meters away. The steps from the lowest level of the plot up to the parking lot are laid in calçada. To the front of the house, the plot is also on a slope and there are decorative bushes and trees, including s few palm trees. 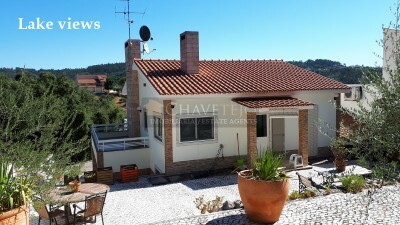 The property is only 300 meters from the shores of the Castelo do Bode lake away. The nearest beach spot is quite private and tranquil. Here you can chill out all by yourself and go for a swim, or launch your boar, go fishing or have a pic nic. Castelo do Bode lake is popular for all kinds of water sport activities including swimming, sailing, canoeing, scuba diving, wind surfing and water skiing, and also supplies the drinking water to Lisbon and other towns. We are a seven minute drive from the center of the village of Serra. It´s 16 km from the center of Tomar. Tomar is a bustling market town, which has a good variety of supermarkets, cafes, restaurants, banks, shops, pharmacies, health centers, sports centers, library, university, hospital, bus and train station, historic monuments and parks. The nearest beach on the Atlantic ocean is an hour and ten minutes drive away. The nearest airport is in Lisbon, 140 km away, and it takes less than an hour and a half to drive there.